Now I know I have written on this concealer before, and how much I love it. But to reiterate: 1. Yep, it’s expensive ($70) 2. Yes, I do think it is worth it. 3. It covers everything beautifully – dark circles (even mine! ), redness, blemishes. It stays put, doesn’t move, doesn’t crease. 4. It lasts a loooong time. I’m only halfway through mine currently, and it is over 6 months old. 5. Great formulation – easy to apply and blend. 6. Yes, you probably have heard of it – It has won every beauty award ever for best concealer because of #3, #4, and #5. Link to product below and image from Saks.com. 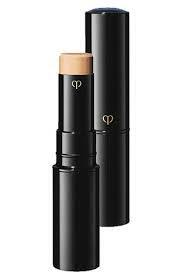 Cle De Peau Concealer. Disclaimer: (Unfortunately) I am not reimbursed in any way for any of these reviews. This entry was posted in Beauty, Cosmetics and tagged Best concealer, best undereye concealer, Cle de Peau concealer, Cle de Peau concealer review by surgeoninkicks. Bookmark the permalink.